Anyway I finished the wallpaper! x3 I'm so happy, but I could die too! @_@ It was my most difficult wall! The wallpaper is really dificullt ( especially for me, a beginner xD). My work is divided in several parts. Really a Try my best! 3) problems with perspective - I used the rules but some parts could looks strange :( The fireplace is a little too big. I can only imagine all the hard work and time your put into this. It really payed off as well. The gorgeousness of this wall really outweighs the smalls mistakes you made. And honestly, I could tell that was a rug without you saying...I think it looks just fine. I like the contrast of it with her hair and dress as well. Amazing work! Aw, now this is just awesome. The vector is nicely done and the background is well made also! 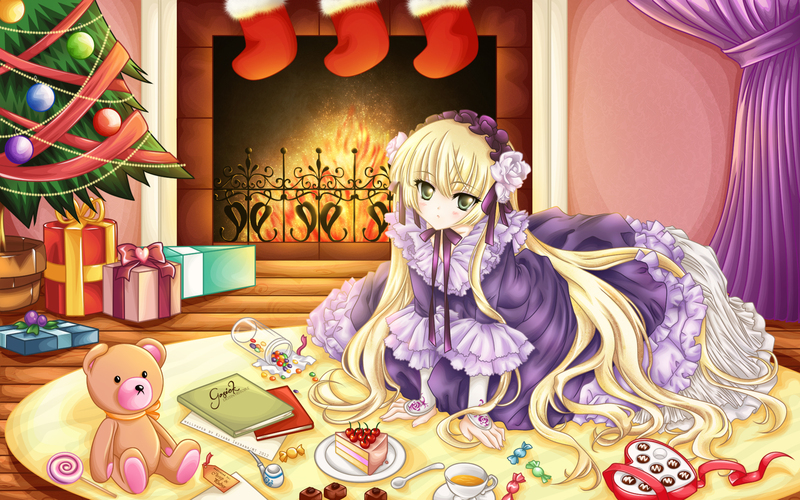 Such a cute (and late XD) christmas wall. Very good! Oh Kiyana you made my day! This is what I miss about minitokyo! Sure, here and there are mistakes, but they do not disturb me at all, as Pulver says. Awesome details, wonderfull choice of picture and background. So much love in every layer, I can actually feel and see your effort in every line. A high quality wallpaper full of love, thank you so much, I love it! Really, you became a top waller in this community and I'm so happy, that you're still here to show us your gorgeous art. This is a very elegant wallpaper! I love Gosick! Thanks for sharing!